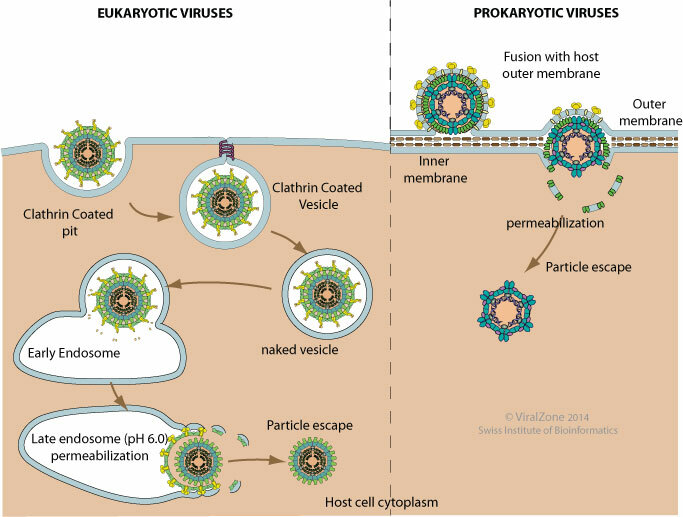 Some non-enveloped viruses induce local permeabilization of host endosomal membrane to allow virus capsid penetration into the cytoplasm. This is achieved through the interaction between the host membrane and a membrane-penetration protein associated with the capsid. Viral membrane-penetration protein might require first to be activated, mostly through endosomal acidic pH or receptor binding to display its membrane penetrating activity. Interestingly it has been shown for rotavirus that the proteins responsible for membrane permeabilization share common mechanisms with enveloped virus fusion proteins . Prokaryotic dsRNA viruses also have a membrane-interacting component associated to their capsid. Virus entry causes depolarization of the host cell membrane. As for other dsRNA viruses, this membrane-interacting component might thus induce permeabilization of the cell membrane . .